If there was ever a good time for a St. Louis Blues slump, this was it. The Blues are coming off an uncharacteristic 1-0 loss to the LA Kings. It marks the second time in as many starts that goaltender Brian Elliott received no goal support. Ordinarily, this could be a sign of concern, but it is too early to say the Blues aren’t the contender they appear to be. They’ve locked down a playoff berth, and sit semi-comfortably in the top three seeding of the Western Conference. The Vancouver Canucks are one point behind their 1st overall spot in the conference, but the Detroit Red Wings are still six points behind the Blues for top spot in the Central Division. With the Red Wings, history has proven that no lead in the standings is safe, but the Blues are in no danger of being knocked out of the top four of the West, ensuring home-ice advantage for at least the first round of the playoffs. The bigger concern is the lack of goal scoring. 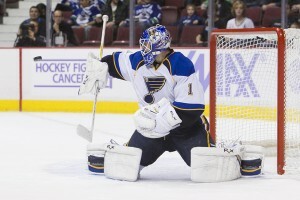 Both goaltenders are sporting goals-against under 2.00. Both goalies’ save percentages are in the .920 and higher. The goaltending duo of Jaroslav Halak and Brian Elliott has proven to be lights-out, giving opposing shooters fits. But their leading scorers share the team league with just 50 points each. Balanced attack is important, and in the playoffs, scoring support will be crucial to any kind of St. Louis run. This is the best time for the Blues to have some adversity. They’ve clinched a playoff berth, and have some time and breathing room to iron out the wrinkles. Adversity only serves to strengthen a team, and the Blues have been on cruise control for a while now. A few speed bumps just before the playoffs will only serve to increase the team chemistry. Ordinarily a slump this close to playoffs might be a cause for concern, but in this case, coach Ken Hitchcock has the experience and command needed to avoid an emotional letdown among his troops. Don’t let the lack of scoring fool you; this Blues team is a dangerous team. Low scoring games are the norm in the playoffs, and the Blues love a tight defensive battle. Despite their struggles, there is no reason to think that the Blues won’t be the team to beat in the West this postseason.